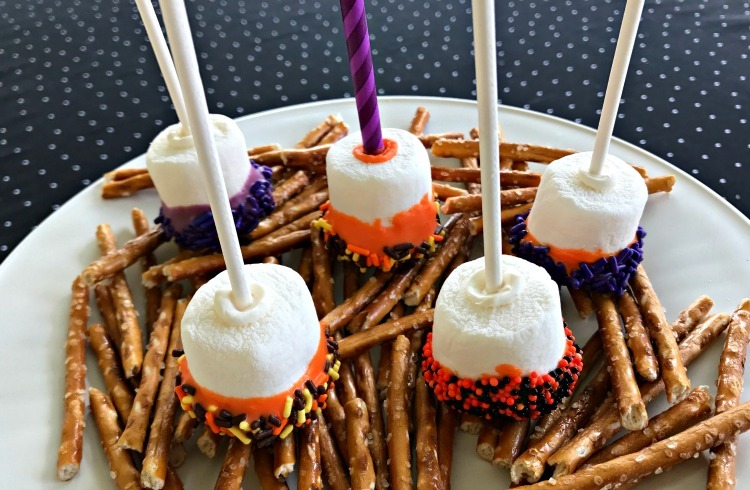 Just a few days til Halloween but you still have time to make these tasty last minute Halloween treats. One secret to making these easy is by using premade items such as Little Debbie Snack Cakes and Rice Krispey Treats. You could start making a new tradition with your kids of just gathering up all of your sprinkles, jimmies, and candy melts and have a fun afternoon. Think like when you go to decorate sugar cookies or a gingerbread house at Christmas, anything goes. Be cautious though of when melting the chocolate it does become hot, so always adult supervision is needed for this part. Getting ready – always follow directions on your bag of candy melts for melting. I usually prefer a double boiler if I’m doing several projects. 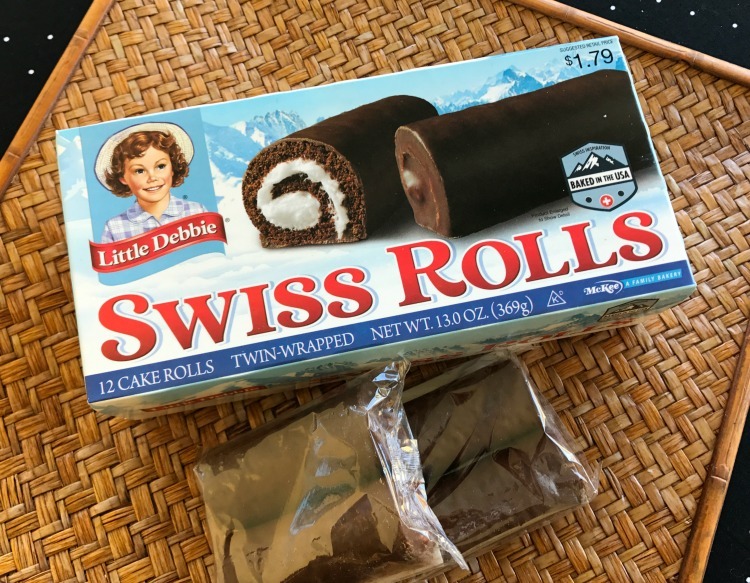 Who doesn’t love Swiss Rolls? When unwrapping these, try not to let that thin outer layer of chocolate come off. 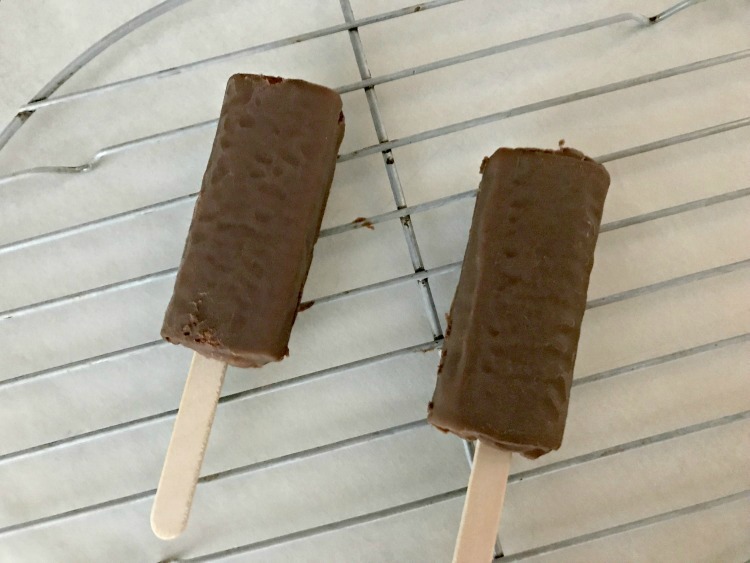 Insert a popsicle/craft stick about half way into one end of the Swiss Roll. 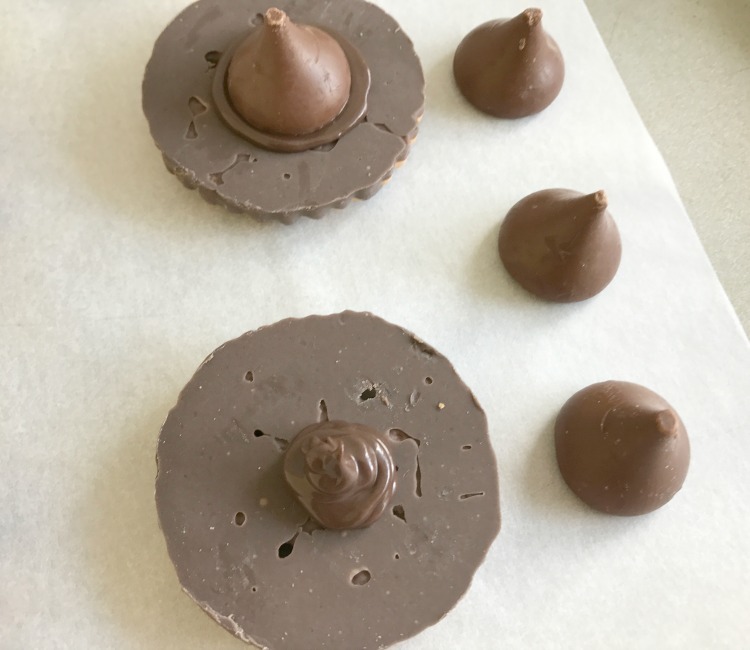 Refrigerate for about 15 minutes or freeze for 5 minutes so that outside layer of chocolate will firm up or you may have trouble with the candy melts sticking to it. Your Swiss Rolls can either be dipped into the melted candy or as I did for this project, I just spooned it over the rolls while they were on a rack. While this is still soft, dip the end into your choice of sprinkles. Add eyes and a couple chocolate sprinkles for a mouth. 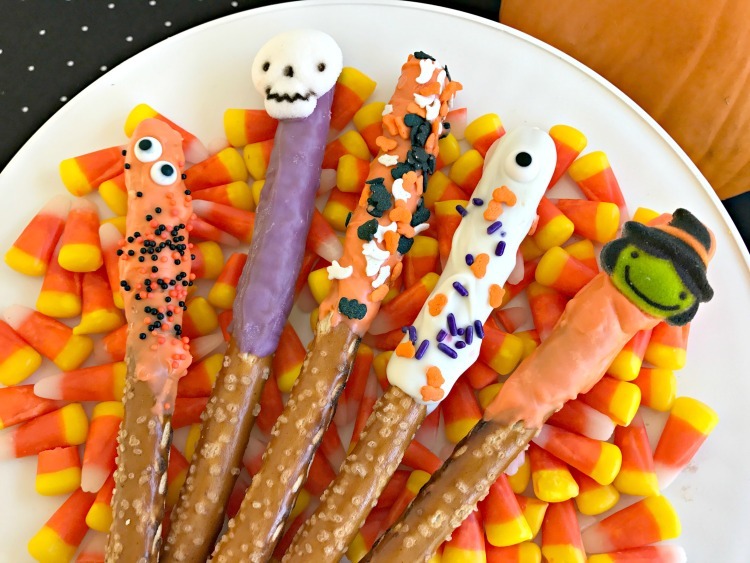 Candy corn or pretzel sticks, which have been broken in half then can be inserted into the side. Marshmallows – regular is what I used. There’s also giant size available. Dip the end of a lollipop stick into a little of the melted chocolate then into the marshamallow. Let this set for about 3 – 5 minutes to harden. This prevents the stick from coming out as easily. Dip into any colored melts and sprinkles. Allow your melted chocolate to cool just a little so it’s not too hot in the pastry bag. 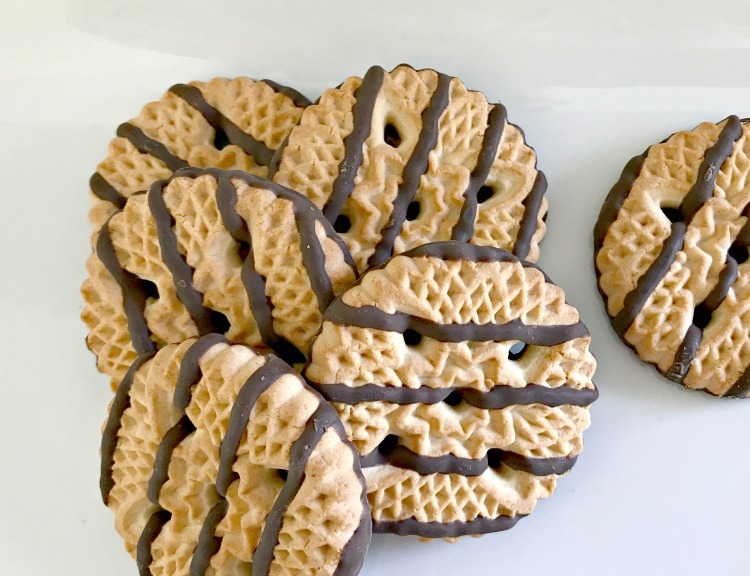 Starting off with these shortbread cookies is a real time saver. Turn your cookie face down. Squeeze a small mound in the middle of the cookie. Immediately place a Kiss on this mound allowing a bit of the chocolate to ooze out. Add your choice of sprinkles. If you don’t have a pastry bag, use a freezer zip-lock bag (not a regular one as freezer bags are stronger). Spoon a small amount of chocolate into the bag and clip one corner, very slightly. Remember you can always cut it off a bit more if needed. 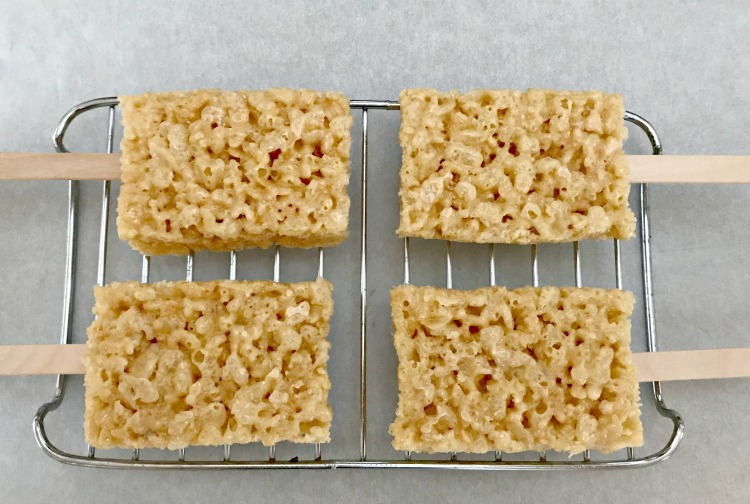 Starting with a pre-made rice krispy treat, made these even easier. Insert stick about half way into treat. If you do these on a baking rack, it will work better for you. Spread a thin coat of the melted chocolate over the treat to just cover it. It’s kind of like doing a crumb coat on a cake. 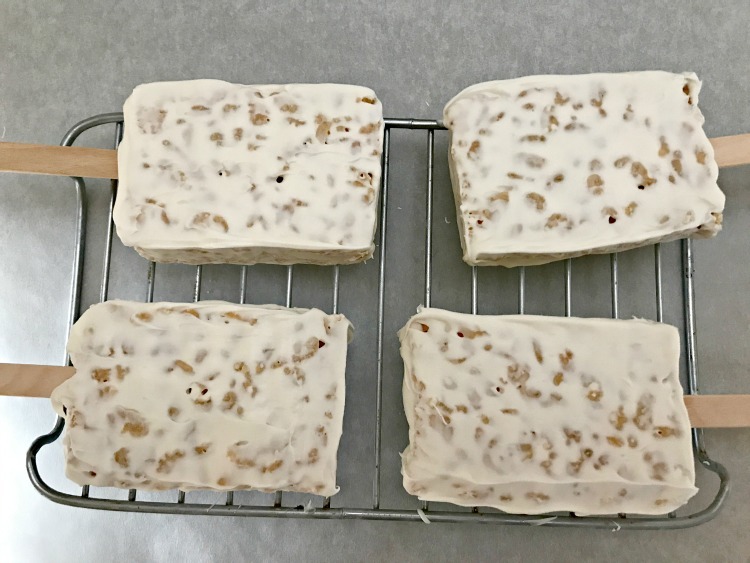 Place in the freezer for about 5 minutes to firm. You will need to let your chocolate cool to about room temperature before putting it into your pastry bag. This is so that when you are making the “fabric” of your mummy it will hold it’s shape. Squeeze your chocolate back and forth across the treat to add as much dimension as you like. If you see the chocolate isn’t holding it’s shape, wait just a minute and you should be fine. Aren’t these as easy as I said? Dip the rods or spoon the melted chocolate over about half of the rod. Add the decorations of your choice. ALL of these treats should be stored in an air-tight container. 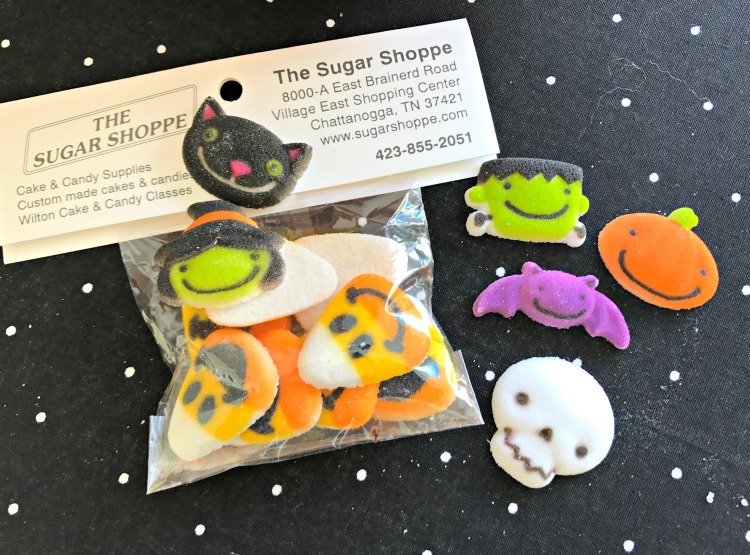 Look around your local area for a one-stop baking shop, such as The Sugar Shoppe here in Chattanooga. 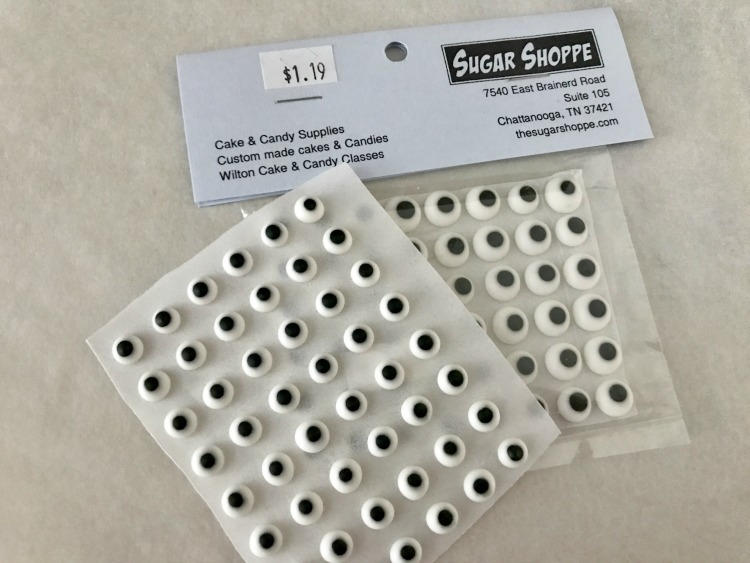 It’s one of the only stores around which offer everything for your baking or candy making needs, custom decorated cakes and supplies. They just recently moved back onto East Brainerd Road. Classes should be offered after the holidays. 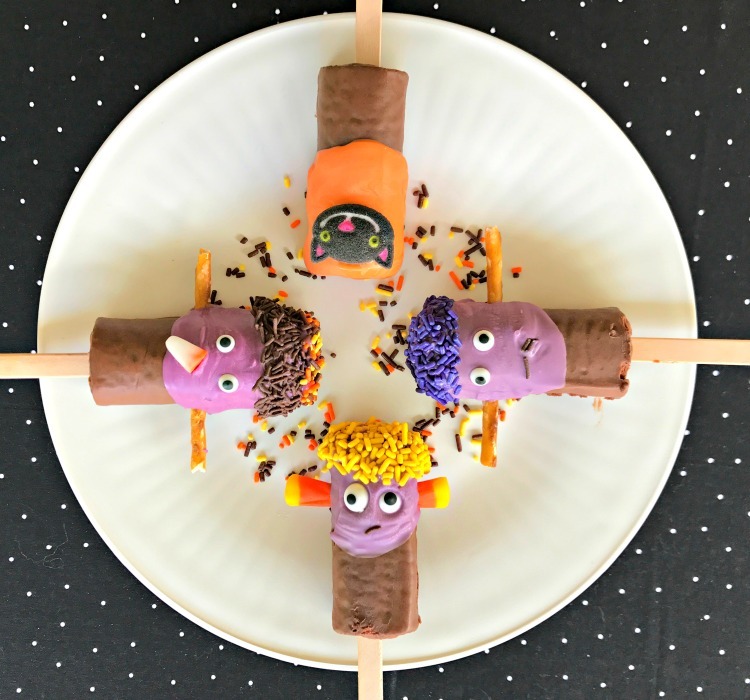 These are some easy and fun treats to make. My kids love making pretzel rods in different colors. I like the idea of the monster pops with the swiss rolls. I would have never thought of that. All of these are so easy. And there’s no rules. Just have fun. These are so cute and creative. 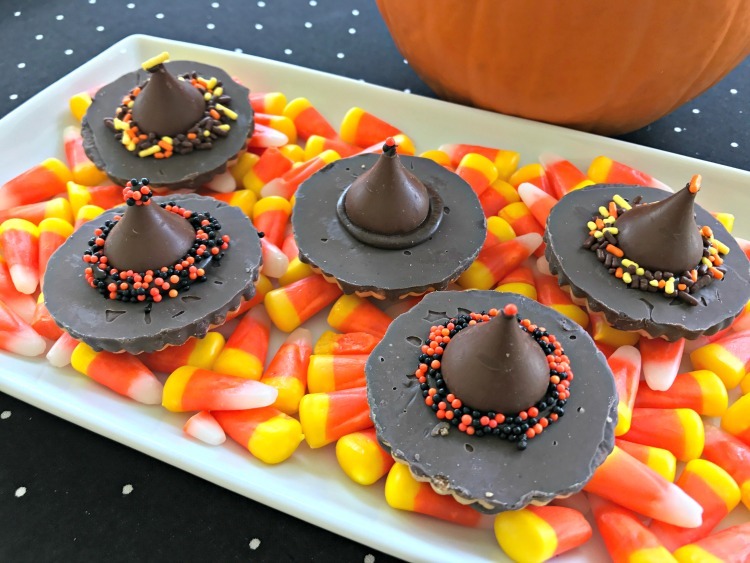 Kids will definitely love these treats. They are quite easy to make. Halloween is so fun! All the creatures and those eye balls we get to play with. I made the hats a few years ago but I like the sprinkles you put on yours. I wish I could run out now for the Swiss roll monsters. Happy Halloween, loved the witch hats so much, must be really delicious to eat:). Swiss roll monster treat was as well a good idea. Always love cute and easy treats. Why spend hours and hours when they are devoured in just seconds. These are such fun snacks, I loved each and every one of them. You are very creative! Always fun to do and to use any leftover melted chocolate. Those monster rolls and witchy hat they look so lovely, kids will definitely like them. Saving your recipe coz even its not Halloween, we can do these! All of these treats look so amazing! I would make them no matter if it was Halloween or not. Yum! Good ideas for co-workers too. 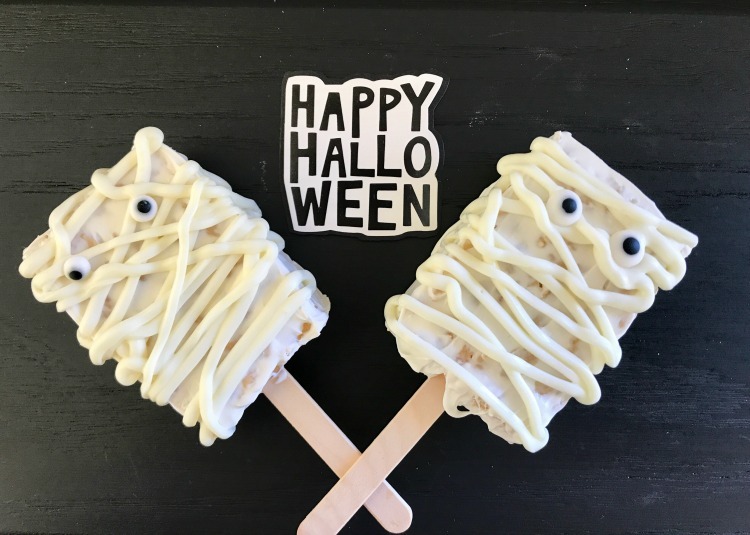 OMG you outdid the Halloween treat world – that is for sure!! HOT DAMn these are amazing!! And I’m thinking of making Pilgrim hats, but then I’m afraid some would say it’s not a popular idea. I love every single dessert recipes you have here. If I was a child, I would probably say, “I want Halloween all year round.” Haha. Thank you for sharing your recipes. I will definitely try it next time. Sometimes the easiest are the best.